THE PASSIONATE PRO-LIFER TURNED ABOLITIONIST: If Christians won't stand up for the babies, who will? If Christians won't stand up for the babies, who will? Since visiting your store with a brochure about our Personhood campaign for 2010 and our signature gathering effort, my spirit has been terribly troubled that your register assistant told me that you would not allow the brochure on your bulletin board and that we should not attempt to gather signatures outside the store. As I told the young woman who advised me of the store's policy to avoid politics, it is more than politics. It is the human rights battle of our generation! The Bible implores us in Proverbs 24:11-12, to rescue those being unjustly led to the slaughter. Can Christians really continue in our apathy while 4,000 babies are dismembered daily? 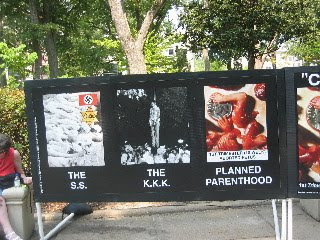 This organization explains the biblical mandate to do something to stop the abortion holocaust! Since the Amendment 48 vote in 2008, Personhood efforts are springing up around the country. 30 states are now pursuing Personhood campaigns to bring legal protection to the pre-born child. are Life, liberty and the pursuit of happiness." Becky and I as individuals are very pro-life, but this is a personal choice and a very political issue whether we want it to be or not. As stewards of our bookstore we have made many tough choices. It seems like not a week goes by that individuals in the community question our faith about one thing or another. We apologize if our decision has troubled your spirit. I appreciate your reply but have to ask if you would have had the same reaction to the plight of the Jews in Hitler's Germany who were being led to the gas chambers? It was legal to kill them. Would you really have stood idly by and wondered if people would possibly buy fewer of your books if you tried to help a Jewish family? Slavery was ended by people of conscience and so was the holocaust. One can no longer claim to be pro-life without taking action. We are our brother's keeper in a sense and we can't turn a blind eye to human rights abuses all around us. I might suggest that you view an incredible article that ran in the NY Timesa few weeks back.